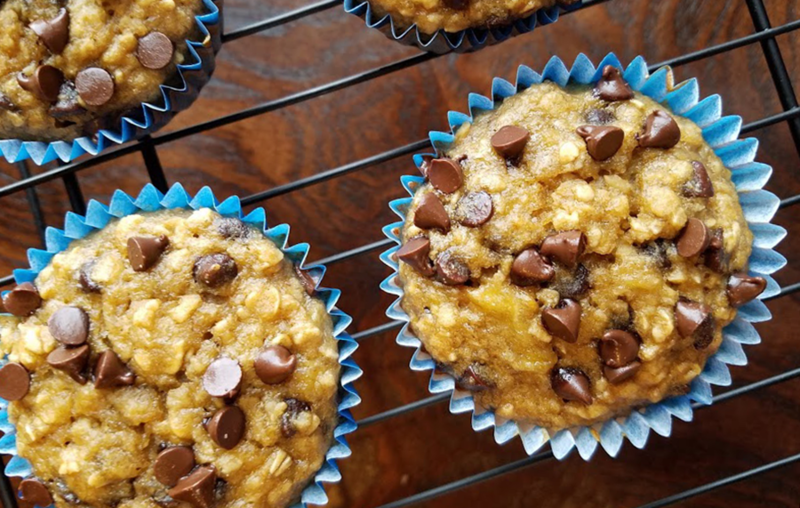 Whole wheat banana chocolate chip muffins are made with white whole wheat flour. Enjoy these tender and moist banana muffins for breakfast or as a sweet treat. The mini chocolate chips provide the perfect amount of chocolate in each bite. Preheat the oven to 325°F. Line a muffin pan(s) with 18 paper liners. In a large mixing bowl, whisk together the oats, flour, baking soda, baking powder, and salt. In another large mixing bowl, mix mashed bananas, applesauce, brown sugar, oil, eggs and vanilla until combined. Add dry ingredients alternatively with buttermilk until dry ingredients are moist. Stir in mini-chocolate chips until just combined. Divide the batter among the muffin cups, filling them most of the way. Bake until the muffins are lightly browned and a toothpick inserted into the center comes out clean, 22-25 minutes. Let the muffins cool 5 minutes in the pan, then remove to a rack. Per Serving (1 muffin): 163 calories, 54 calories from fat, 6g fat, 2g saturated fat, 0g trans fat, 21mg cholesterol, 167mg sodium, 28g total carbohydrates, 2g dietary fiber, 14g sugars, 3g protein, 115mg Potassium. Learn more about farmers that grow wheat.